Ever wonder how Bisquick got its start? Bisquick was introduced in 1931 and is still going strong today. Bisquick has been making great biscuits, pancakes, cobblers and a whole lot more for over 80+ years. Bisquick has been around for as long as I can remember. My mom always had a box of Bisquick in her cupboard, just in case. When I was a newlywed, many years ago, my sister gave me two boxes of Bisquick, a Bisquick Cookbook and an apron. Back then my sister Barb was the Queen of Bisquick. I first heard of “Impossible Pies” from her. but I have recently re-discovered this baking mix. Bisquick was born on a train, over 80 years ago. Carl Smith, sales executive for General Mills, ordered biscuits with his meal. It was well past lunch time when he ordered but fresh, piping hot biscuits arrived within minutes. The Chefs secret? salt in advance and stored the mixture in the ice chest. Smith immediately saw the potential of a premixed baking mix. He took the idea to Charlie Kress, the head chemist at General Mills. Less than one year after Smiths diner-car discovery, Bisquick biscuit mix made its debut in 1931. It was a run-away hit! “So Quick with New Bisquick” “Now a completely New Bisquick!” Was the slogan for the fast moving 60’s. Designed to appeal to makers of Southern-Style Biscuits the New and Improved Bisquick professed to make even lighter, fluffier biscuits than made from scratch biscuits. The reformulated Bisquick preformed so well in test markets that it was rolled out into the national distribution. 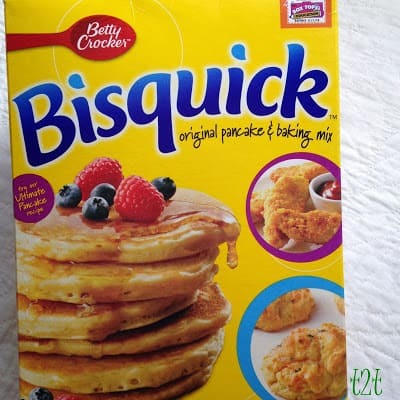 Regular Bisquick was soon replaced and the word “new” was dropped from the product name. The 70’s brought an abundance of new Bisquick recipe ideas. An updated version of a previous cookbook was introduced. The cookbook was packed full with over 200 creative recipes. To celebrate the 50th anniversary of Bisquick, a special cookbook was introduced called; Betty Crocker’s Creative Recipes with Bisquick Beginning in 1981, The “pie that did the impossible, formed its own crust as it baked” was heavily promoted with recipes, product advertising and recipe booklets. The original Impossible Coconut Pie and Impossible Bacon Pie quickly expanded to over 100 different recipe variations, (my sister Barb made at least 85:) Since then these crustless pies have been renamed: “Impossibly Easy Pies” “Impossibly Easy Pies” are still requested favorites to this day. Bisquick continues to be a staple in homes across America. Busy moms and dads depend on Bisquick to get great tasting, home-made meals on the table fast. Thanks for the Bisquick post. I grew up eating and cooking with this great stuff! The bread loaves look great, and I know my family will love them! Thanks for sharing at #ChainLinkyCLIMB! Your post is featured on Full Plate Thursday this week. Hope you have a wonderful week and enjoy your new Red Plate! What a fun post! Happy St. Patrick's Day and thanks so much for sharing with Full Plate Thursday! 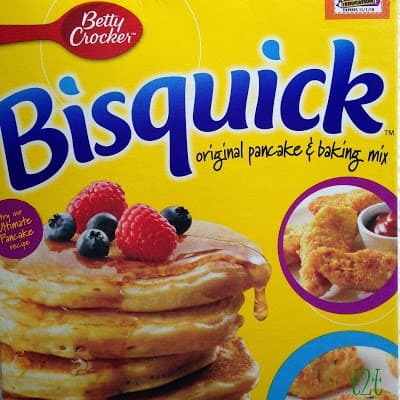 I have just rediscovered Bisquick in the last few moths. I remember our home ec teacher in middle school showing us how to do the peach cobbler with drop bisquick dumplings. Nowadays I use it for butter biscuits. Yum. This makes me want to go out a buy a new box of it! Loving the history here!